Show Cart Icon in Menu: EasyCart offers a widget that will append to the end of a wordpress menu should you choose to. This widget will show cart items to the user as they add them. This widget will only append to the end of a menu and may or may not work depending on your theme used. Hide Menu’s Cart Icon for Empty Cart: IF using the cart icon at the end of a menu, you can choose to have it not visible IF there is zero items in the cart. Enable Gateway Log: The gateway log collects information for each transaction placed to a gateway and is a useful debugging tool if processing payments becomes an issue. IF you are processing payments and go live with your store, it is best to disable the log file and that way no sensitive data is being collected. Show Newsletter Signup Popup: You can enable a popup that will allow users to signup for a newsletter or cancel and close the window. Inquiry Submit POST Variables: When enabled, a product that is in inquiry mode with a custom URL to an inquiry form, we can POST to the custom inquiry form allowing collection of the product ‘model_number’ being requested. As a developer, you can have your custom form collect the POSTed ‘model_number’. Use Custom Post Type Linking: This option is best selected and offers the best SEO url links to products. We recommend you have wordpress permalinks setting set to /postname/ method as well for best results. In setting this, your site will have custom post types created for each category, menu, and product, giving them their own space and linking within WordPress. This option is required if you want to have unique sorting of products on a page, different column spacing for products within categories or pages, and other important page specific related settings. DecoNetwork – Allow Blank Item Purchase: This setting only relates if you use the third party DecoNetwork and will allow customers to simply purchase the product without customization. 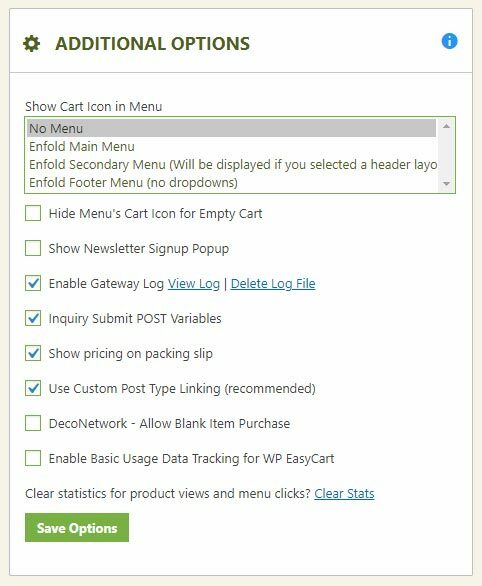 Enable Basic Usage Data Tracking for WP EasyCart: By turning this on, you are allowing anonymous information to be used by WP EasyCart. This information is completely anonymous, and allows us to better understand how the software is used and where to work on new features, bugs, and issues. It will not hurt performance on your site at all. The following settings let you specifically set how and what the search widget for EasyCart behaves. 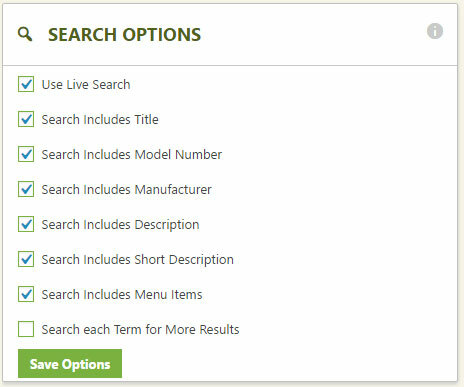 Use Live Search: If enabled, while the user types in the search field, it will give pertinent results. Search Includes: You can decide which fields will be incorporated into the search. Titles, Model Numbers, Manufacturers, Descriptions, Short Descriptions, or Menu Items can all be incorporated into the search of the product. Search Term for More Results: If enabled, the search will return based on which term appears more often than the others. 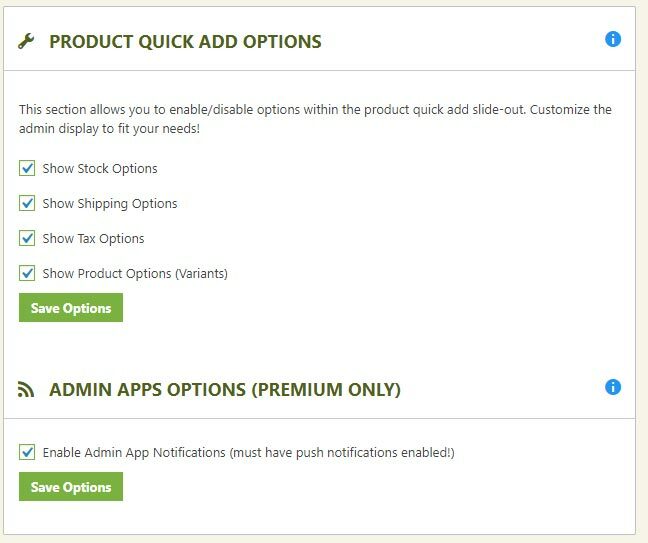 The product quick add options allow you to customize how the ‘Add Product’ slider sidebar works. From here you can enable/disable a few of the custom fields which may or may not help speed up your product entry system. If you do not feel you use these, you can keep a cleaner display by removing them. Premium users will have access to utilize our Phone and Tablet apps with their store system. These apps also now include push notifications that you can receive on your device upon new orders being placed. Simply enable this section, login to your EasyCart app, and you should now receive push notifications on that device for that website. Push notifications will also stream to your wearable devices if you have those connected to your phone or tablet. Be sure to edit your specific device notifications for the WP EasyCart app to work and allow from your phone settings.